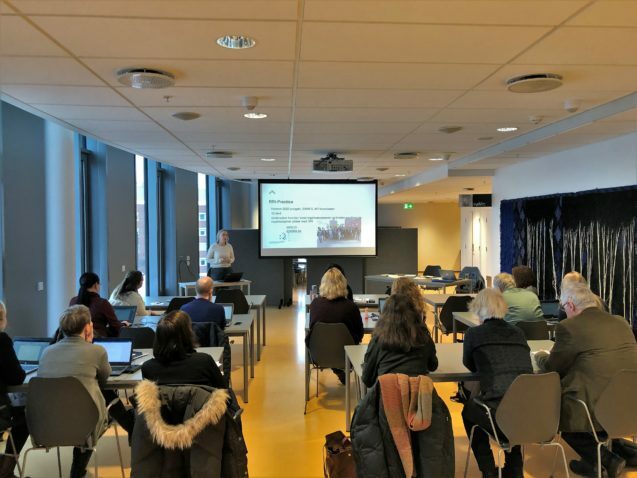 Research group leaders and administrators from across OsloMet – Oslo Metropolitan University came together on Monday, February 4, to learn about RRI, in a course developed under the auspices of RRI-Practice. Current and past members of the OsloMet RRI group Mads Dahl Gjefsen, Erik Thorstensen and Ellen-Marie Forsberg presented RRI efforts from the policy and research world, and gave a taste of what is happening in the current RRI projects at OsloMet: Assisted Living, FIT4FOOD2030, and RRI-Practice. Participants explored new ways to work with RRI in their home units and subjects, and got acquainted with RRI resources compiled by RRI Practice for campus audiences, while enjoying a beautiful view of wintery Oslo. The course will continue after the RRI-Practice project, and conversations are in the works for additional modules with practical training for early career researchers and other campus audiences.